A change of heart, or a change of propaganda? Yael has rather a breathless post tonight about what she takes to be the implications of the apparently momentous step by the Palestinian Fatah movement to ban its former partner in the "National Unity Government" of the Palestinian Authority, Hamas. And according to one of her Palestinian fellow bloggers, Palestinian Authority TV has now started turning out broadcasts that stigmatize and demonize Hamas just as for so many years they have stigmatized and demonized Israel. It all reminds me of those scenes in George Orwell's "1984" where the propaganda machine shifts the population seemlessly and without a pause for breath from fighting enemy-to-the-death Country 1 to fighting allies-for-ever Country 2. Only in this case, it's the other way round. As Yael pointed out in an earlier post, this is the same Fatah whose Dahlan claimed only the other day that the whole Hamas coup was an Israeli plot anyway. And, by the way, didn't he also recently claim that the reason Hamas was able to trounce Fatah so quickly and decisively in the battle for Gaza was that the poor Fatah fighters were so exhausted by their years of struggle with Israel? traditions from the Stalinist yearbook, which overlaid itself in recent years with a veneer of Islamism. Maybe I'm being too cynical. Maybe those hundreds of Palestinian organizations and trade unions, all controlled by Fatah, will now pass hundreds of identical resolutions overturning their call for a total boycott of Israel and calling instead for a total boycott of Iran, Syria and the Muslim Brotherhood worldwide. Oooh, look--did you see those pigs just turning aerial somersaults as they zoomed past the window? "They're simply negotiating the power-sharing arrangements"
You may have thought all those appalling accounts you're hearing from Gaza of Hamas and Fatah gunmen doing things like hurling each other off roofs, shooting up hospital patients with rocket-propelled grenades and murdering each other's families were evidence of some sort of low intensity civil war in progress. But, thanks to Tuesday night's BBC Radio 4 "The World Tonight", we now know that what they are really doing is "negotiating the power-sharing arrangements" between Fatah and Hamas in the Palestinian Authority. Yes, those are the exact words used by Dr Khalil Shikaki, presented to us as a "pollster and academic" based in Ramallah. He added. "We are still pretty much in the signalling phase." You can listen in for yourself online by clicking on the "World Tonight" link, and clicking the "Listen Again" link for Tuesday's edition. The coverage of the Gaza situation starts about 7 and a half minutes into the clip, and includes some good comprehensive coverage of the shennanigans going on on the streets and in the hospitals. The interview with Dr Shikaki starts about 19 minutes 15 seconds in to the clip. It should be available till at least 10:00pm London time on Monday 18th June. Dr Shikaki explained how, no, Hamas wasn't quite happy with the security arrangements as they were and they wanted to send a signal to Fatah. In fact both groups were actually sending signals to each other. I suppose it's all much the same as those sort of signals the mafia send out when they come round and burn your house down. But his analysis is not too far away from that offered by in Haaretz' report on Tuesday night by Sami Abu Zuri, a Hamas spokesman who said that Hamas was simply trying to restore law and order. Dr Shikaki is a curiously ambiguous and Janus-like figure, but you wouldn't know that if you just heard him as presented by "The World Tonight". According to Campus Watch, he has a track record of being associat with the radical Islamist terror group Palestinian Islamic Jihad, though he has always vigorously denied this. And the respected commentator Martin Kramer agrees that he's no terrorist or terrorist sympathizer, but it's the reliability of his polls that he takes issue with. It was after all, he reminds us, Shakaki's polls which failed to predict the substantial Hamas victory in the 2006 Palestinian Authority elections, and perhaps lulled the US and Britain into supporting the election process even though Hamas were standing for office, something of course a terror-supporting group with its own private army would never be allowed to do in either country. However you read Shikaki, the most interesting thing I draw from his polls (and I doubt they could all be faked) is the consistent evidence they present that Palestinians admire Israeli democracy and they even admire it more than any other democracy. So given that, what price those hundreds of exactly identical resolutions from dozens of PalestinianNGOS which call for a complete cultural, social, political and economic boycott of Israel and which the pro-boycott activists of UCU cite in justification of their boycott proposals? It couldn't be, could it, that they have no more relationship to the real views of the Palestinian public than the pro-boycott resolutions of UCU and UNISON have to those of their ordinary members? This story is a classic version of how to amplify a pipsqueak from some mice into a great lion's roar. Israel threatens British boycott, The Times portentously tells us. The reality of the "massive demonstration", the "international event of the year in pro-Palestinian activism". 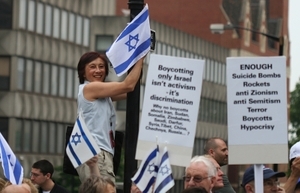 Note the hollow and hypocritical opportunism of the pro-boycotters' banner, "It's kosher to boycott Israeli goods", especially when carried, in defiance of Jewish religious rules, on the Jewish sabbath. Then next to it there's the huge "Jews for Justice for Palestinians" poster, which seems larger than the group of people marching under its slogan. [Thanks to Jonathan Hoffman for supplying this image. The ones that follow are by the wonderful Tanya Nagar who specialises in photographing demos. See her revealing comments on the demo here. ] 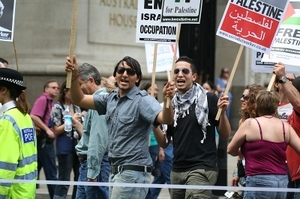 Saturday 9th June was meant to be a massive demonstration in London against the Israeli occupation and in favour of the Palestinians. 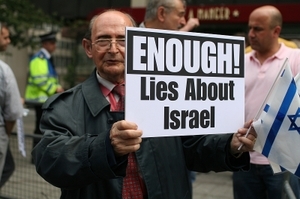 It was organized by a relatively new pro-Palestinian pressure group, Enough! with the support of such unions as UNISON and UCU who are currently at the heart of attempts to start union boycotts of Israeli goods, individuals and institutions. Enough's founding supporters include a motley range of unions, including the massive Transport & General Workers' Union, Amicus, the largest white-collar union and the insignificant and otherwise politically mute Bakers, Food and Allied Workers' Union. 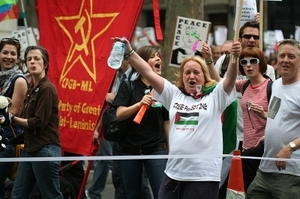 It also includes the radical Islamist Muslim Association of Britain-- open supporters of Hizbollah and Hamas, and the SWP dominated Stop the War coalition, a range of Arab pressure groups and a long standing array of pro-Palestinian and anti-zionist groups, including the notorious "Neturei Karta" Chassidic renegade groupuscule who participated in President Ahmadinejad's "Was there really a Holocaust?" conference in Iran. 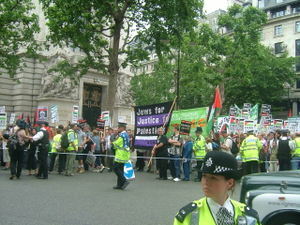 So really, it should have amounted to a massive turn-out of all the possible anti-Israel forces in Britain. The ENOUGH! coalition is organising a major national demonstration and rally to take place in London on the afternoon of 9 June 2007 - the international day of action to mark the 40th anniversary under the slogan: "The World Says No to Israeli Occupation". The ENOUGH! coalition is organising a major national demonstration and rally to take place in London on the afternoon of 9 June 2007 - the international day of action to mark the 40th anniversary under the slogan: "The World Says No to Israeli Occupation". This is the primary international event of the year in support of the Palestinian people, and we are hoping to have tens of thousands of people at the rally to send a strong message both to the Israeli government and to No 10 Downing Street., and we are hoping to have tens of thousands of people at the rally to send a strong message both to the Israeli government and to No 10 Downing Street. It seems that the most this "primary international event of the year" could drum up was too small even to get a tiny mention on the BBC News web site on Saturday night, or even a mention on the Guardian or Independent web sites. So much for the reality of the union support for anti-Israel action. The Trotskyist and allied activists who dominate so many of the union meetings and conferences may be able to get motions passed and union money used to fund high profile, well resourced publicity and demonstration organization. The combined membership of TGWU and Amicus alone (and they have just voted to amalgamate) is over 2,000,000. But they can't even get a sufficiently large number of the membership for the entire Enough! coalition out to support what was billed as their key demonstration event of the year. You have received this email because you are someone who cares about the one and only Jewish State. This is not your typical urban-legend “chain email”. 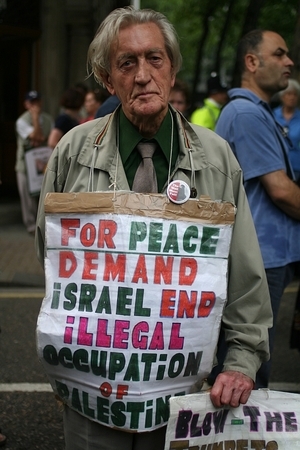 This is about a real political issue— the growing British boycott of Israel. The chief union of British university professors has just voted to boycott Israel and to urge its members to terminate their relations with Israeli faculty and researchers. Worse, Britain’s largest and most influential union of government employees (1.4 million members) is expected to enact its own boycott and divestment campaign later this month. 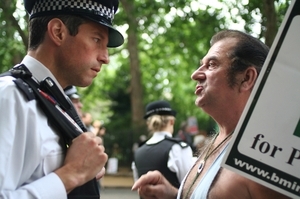 Other groups, including the Transport and General Workers' Union (900,000 members), the National Union of Journalists, the British Association of Architects, and the British Medical Association, have implemented or are now considering their own boycotts. It is not a stretch to say that these measures constitute a nationwide boycott of Israel. However, a boycott can be a two-way street. While the State of Israel, with its tiny population and economy, cannot respond in kind, we in North America can. So until Britain changes its attitude and policies 180-degrees, please do not travel to Britain, do not partake of British products or brands (e.g. HSBC Bank, Reebok, Umbro, Burberry, French Connection, Virgin Megastores, Cadbury, Twinings, InterContinental Hotels, Amstrad, Invensys, Economist Magazine, Financial Times, Jane’s Information Group), do not spend money on British movies or music, do not fly on any British airline (e.g. British Airways, Virgin Atlantic), and, if this applies to you, consider limiting your business with British nationals, divesting your British assets, and/or voting against tenure for British faculty in your department. 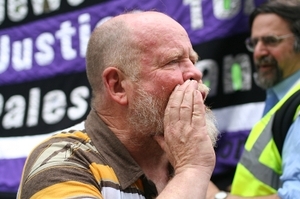 The rise of the boycott campaign in British professional unions coincides with their precipitous decline as effective agents of collective bargaining and industrial democracy. The constituent predecessors of the UCU, the AUT and NATFHE, had consistently failed to address the long-term decline in academic salaries and deep under-investment in UK universities. They showed themselves to be largely impotent in their attempts to protect their members' wages and working conditions. While tuition fees have soared, the government has made no serious attempt to correct the deterioration that threatens British institutions of higher education. It has also recently imposed deep cuts on research funding. The impresarios of the annual boycott hunt that now pollutes the UCU (and other professional unions in this country) have substituted the campaign against Israel for serious union activity addressing these issues. It's not just the professional unions, Shalom. All union membership in the UK has declined massively, since so many people find them irrelevant to their work situation, and many despise their political posturing. That's the reason why Amicus, the main white collar union, whose very raison d'etre was to distinguish its members from rank and file workers, is now about to merge with the TGWU, the paradigm case of the blue-collar workers' union. So yes, there is a job to be done in fighting the propaganda unleashed in favour of boycotting Israel. But the best way to do that is to expose just where it's coming from and how empty and preposterous are the threats and boasts of those who want to set this particular political bandwagon in motion. UPDATE:A correspondent who was on the counter-demonstration to the Enough! demo says he estimated not more than 3,000 came to support this "primary international event of the year". That coincides with my reading of its non-appearance on the BBC and other news media usually only to keen to report anti-government and anti-Israel demonstrations. Is this the way to stop a boycott? There's a whole series of these powerful and punchy posters/web ads here at the ADL site. They seem to show up starkly the hollow selectivity of the UCU's proposed boycott; the blatant ignoring of huge massacres and attacks on freedom across the world, whilst calling for Israeli universities and academics to be boycotted. So that's the leading US Jewish organization which exists to fight anti-semitism. 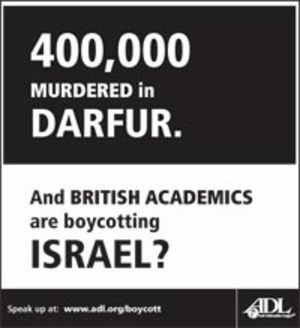 And how is the organized UK Jewish community responding to the proposed boycott? After two years of primarily outsourcing the campaign against the previous proposed AUT boycott to the Engage, something I've repeatedly argued, produced a degree of complacency and self-delusion that helped to smooth the path of the disastrous merger of the two unions which has resulted in the UCU. And, as I've been predicting since 2005, it's now dominated by the SWP-led would-be revolutionaries who did so much to make NATFHE into a byword for ineptitude, unsuccessful pay campaigning and absurd radical political gesture politics. Well, the latest effort in the organized Jewish community's efforts to combat the UCU's pro-boycott resolutions is a Stop the Boycott campaign. We call on UCU General Secretary Sally Hunt to fulfill her manifesto commitment to take this decision to a full membership ballot. Indeed, this boycott is damaging for the union itself and is not representative of the union. Note to BICOM and the brilliant minds behind the "Stop the Boycott" campaign: a promise to make a proposal is not at all the same thing as a commitment to hold a membership ballot. Especially in a situation where no General Secretary has the powers to make such a commitment anyway. If I was Sally Hunt, I would be hopping livid at this campaign for misrepresenting my manifesto pledges and whipping up a national and international campaign to call for me to do something I have no powers to do. But it just gets worse and worse than that. I have to close down for Shabbos now. But tomorrow night, I'll be back to spell out some more about just how wrong-footed, misguided and counter productive this whole UK Jewish community campaign is. And I so wish it wasn't. What's behind the Alan Johnston video? Caution: this is entirely my speculation, based on joining dots between some of the news stories about the UK's actions on Alan Johnston. So here we have a video posted of Alan Johnston, the kidnapped BBC Gaza correspondent. `This is after the man has been missing for 81 days, by far the longest period of any of the many previous kidnaps of journalists by Gaza's assorted terror groups. After all this time, why is this evidence that he was alive when it was made only being posted now? It's interesting that in the BBC Radio 4 news reports I heard of it when it was first announced earlier this morning, it referred to the message that he spoke centring on the need to lift the economic "siege" of Gaza (the BBC newsreader's words) imposed by the sanctions from the USA and UK. We want Britain to free our prisoners and we specify Sheikh Abu Qatada al-Filistini, and at this position we won't forget our prisoners in the other infidel states and we say to them, free our prisoners or we will deal with you the same. We don't specify a state without the others. And we say if you want the ransom to free them we will give you to the last piece of gold as the Prophet, peace be upon him, told us to do. In three years here in the Palestinian territories, I've witnessed the huge suffering of the Palestinian people. And my message is that their suffering is continuing, and that it is unacceptable. Every day there are Palestinians arrested, imprisoned for no reason. People are killed on a daily basis. The economic suffering is terrible, especially here in Gaza where there's an Israeli [audio jumps] absolute despair after nearly 40 years of Israeli occupation which has been supported by the West. The situation in Iraq is even worse, we see every day maybe 100 or more Iraqis being killed, in the violence there which followed the failed invasion of Iraq by America and Britain. Ordinary people who are losing everything and can't live their lives properly. Because of not just the violence, but the shortage of everything they need for normal lives, for bringing up their children. Errr... Afghanistan, the situation again terrible. You see on your television screens ordinary people [audio jumps] suffering as the armies of America and B... [audio jumps] America attack [audio jumps] attack. In all this, we can see the British government endlessly working to occupy, err, the Muslim lands, against the will of the people in those places. From history, the British worked to bring about the state of Israel, which is the cause of all the suffering of the Israeli... of the Palestinian people, and we, the British, are completely to blame, along with the Americans, for the situation in Iraq, and the British are the main force in Afghanistan, causing all the trouble to ordinary, simple Afghans who simply want to live. The BBC's major radio 4 afternoon news programme, PM, even featured former hostage Terry Waite saying he sympathized with the kidnappers' message about the Israeli occupation, and this above all was the one thing they needed to attend to. Which brings us to the question of why this video was released now, and what exactly lies behind it. It seems to me to be too much of a coincidence that in the last week a senior Hamas spokesman, Dr Ghazi Hamad has been in the UK, ostensibly on a "private visit" to participate in the Guardian-sponsored Hay on Wye Literary Festival, also being broadcast on BBC Radio 4. And, given little press coverage is the fact that he has also been involved in talks in the Foreign Office related to their attempts to get Alan Johnston freed. So last weekend he actually met with a Foreign Office civil servant to discuss the release of Johnston. Dr Hamad, who is considered a moderate, had met Mr Johnston and claimed to have made contact with his kidnappers. More recently Hamad, serving as a spokesman for Hamas, has said of Israel (in response to the Beit Hanoun November 2006 incident), "Israel should be wiped from the face of the Earth. It is an animal state that recognises no human worth. It is a cancer that should be eradicated." I think what we're seeing here is the visible tip of a negotiation process. I think the video was shown to provide proof that Johnston was alive prior to some agreed concessions or quid pro quo from the UK government. If that's what's happening, will we find that Abu Qatada suddenly gets an appeal upheld and gets released? Or will he somehow succeed in getting extradition to Jordan turned down? One thing's for sure. The BBC won't be telling us what's really going on.